I can see the rain. Still have never seen an owl, except in captivity. Would be awesome. Oh, I love this. The owl looks so cool, and yet so alert. And thanks for pointing out the rain – I would have missed the presence of the drops otherwise. That’s a wonderful photo of a beautiful subject. What a landscape! Wow – this is great. Is that a burrowing owl? I love that he seems to be enjoying the rain. It is also a neat scene – rain and a cactus – not two things I usually think of together! What a well captured owl. What a wonderful shot, Bev! I, too, missed the falling raindrops at first glance. Too busy focusing on that handsome owl, I guess. Excellent capture of the owl! It looks so detailed. And you’re dedicated to hang out in the rain taking pictures of owls! 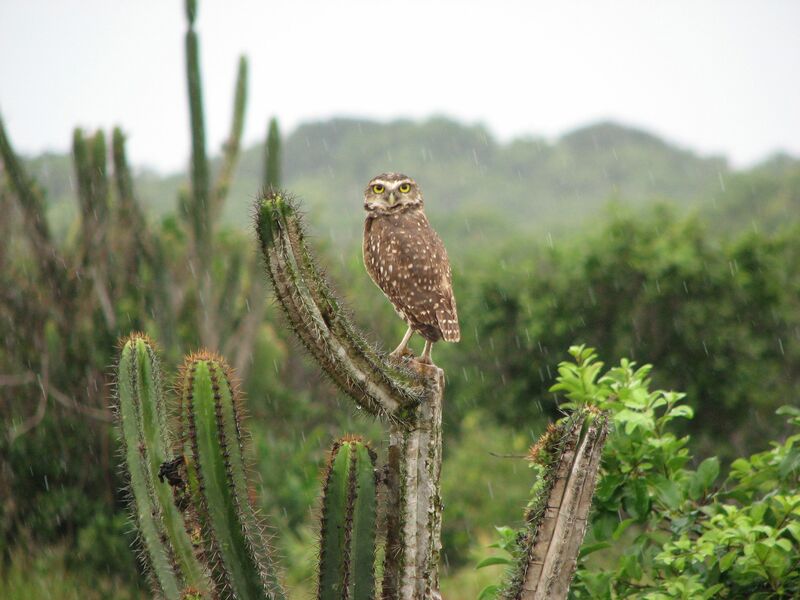 All the elements of nature are here – Owl, rain, plant/cactus, foreground/mountains. I’ve really got to get out birding more….this is a great shot! This is the kind of vacation pic I’d like to have! Thanks for the enlargement to see the rain. What did you wear on your head?